Tonight we are gathered at Site:Brooklyn Gallery for the opening of Color: Primary to Tertiary. Super to connect with Lily way who chose one of my works to appear in this show. Shanlin Ye: "it's a privilege to join this International Juried exhibition curated by Lilly Wei at Site:Brooklyn. Will be featuring one of my figurative works." Delighted to participate in this show with many talented artists from around the world - will include work from my Monologue Series. Artist statement for Monologue: "Water leaves marks on the paper like a memory that can’t be erased or obliterated, inadvertent yet unforgettable - all kinds of chance encounters conflicting and blending. The wanton flowing of the water would seek to drown out all detail, features and colors becoming blurred. And where color was not applied, they appear all the more dazzling, formed of rough particles of black and white. My subjects emerged without names, race, identity or background, stubbornly existing - calling out - up until the moment of their discovery. They became the solitary protagonists and I became the attendant of their intimate monologues, sharing with me their secrets." ABOUT THE JUROR: Stephen Westfall received his MFA in 1978 from the University of California, Santa Barbara and has been exhibiting in the US and internationally since the 1980s. He has works in the collections of the Whitney Museum of American Art in New York, the Kemper Museum in Kansas City, the Louisiana Museum in Humlebaek, Denmark, the Munson Williams Proctor Museum in Utica, New York, the Baltimore Museum of Art and the Museum of Fine Arts, Boston. He is currently a professor at the Mason Gross School of the Arts at Rutgers University and in the graduate program at Bard University, as well as a Contributing Editor at Art in America. I am participating in the 20th Anniversary show at Jim Kempner Fine Art showing now through November 5, 2017. Attending the opening was a phenomenal opportunity to meet with the other gallery artists. Artists include Robert Attanasio, Jennifer Bartlett, Christopher Beane, Stanley Casselman, Long Bin Chen, Christo, Jeff Chyatte, Chuck Close, Eduardo Del Valle & Mirta Gomez, Jim Dine, Lin Emery, Sam Francis, Rinaldo Frattolillo, Gianfranco Gorgoni, John Henry, Charlie Hewitt, Tanja Hollander, Jasper Johns, Deborah Kass, Alex Katz, Jay Kelly, Jerry Mischak, David Mitchell, Robert Motherwell, Graham Nash, Bruce Nauman, Craig Norton, Claes Oldenburg, Yoko Ono, Jacob Ouillette, Greg Parker, Robert Petersen, Robert Rauschenberg, Ligorano/Reese, Randy Regier, James Rosenquist, Ed Ruscha, Jonathan Santlofer, Sean Scully, Tom Slaughter, Frank Stella, Pal Svensson, Wayne Thiebaud, Boaz Vaadia, Bernar Venet, Andy Warhol, and Shanlin Ye. Exhibition 20 Years at 23rd and 10th: showing works on all three levels of Jim Kempner Fine Art. At Gallery 456 managed by Zhou Longzhang (周龙章), curatorial wife-and-husband team Lan Lan (纽约蓝蓝， 张兰）and Michael Daly of Incidental Art curated "Dawn: Exhbition of 7 Artists". The show included work from my Reflection Series (镜像系列 Shanlin Ye, 叶山林). Thanks to Jim Kempner Fine Art for supporting this show. 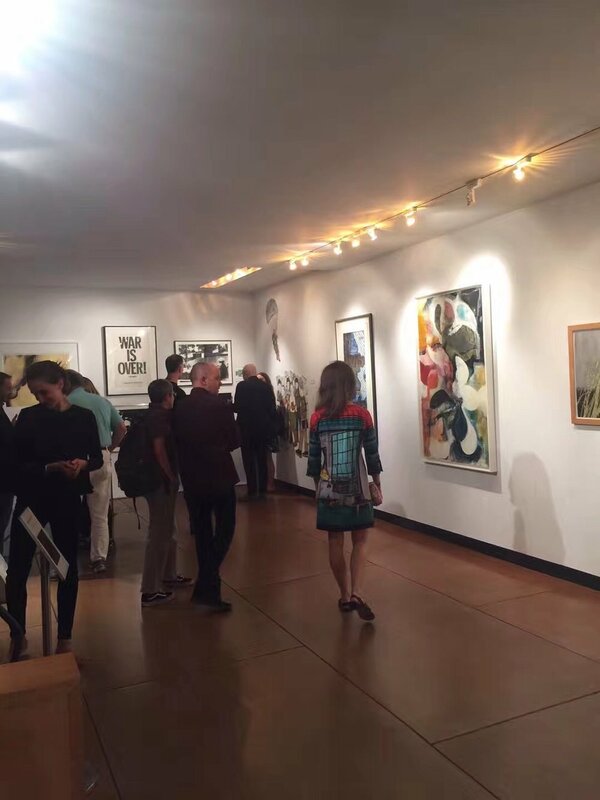 We had the opening reception Sept 1. It was a fantastic opportunity to connect with other artists and friends in the NYC Chinese arts community. Below, please enjoy text of the full "master cut" of my interview with Sinotelevision and the edited product. Thanks to Stuart Bradley for the translation. Just arrived to LGA for an exhibit at Gallery 456 otherwise known as the Chinese American Arts Council. Thanks to Tim Bradley for his support in St. Louis while we make this trip.